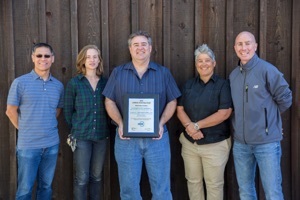 The barn won technology awards from the Golden Gate Chapter and Region X of ASHRAE, a 56,000-member organization that represents heating, ventilation, air conditioning, and refrigeration professionals. The project also received an honorable mention in the national ASHRAE competition. The Hay Barn, a certified LEED-2009 Gold building, has previously received honors from architects, preservationists, and woodworkers. The restoration of the dilapidated historic structure incorporated period construction techniques from the 1860s. 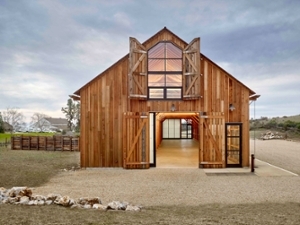 Now home to the headquarters of the Center for Agroecology and Sustainable Food Systems (CASFS), the barn is a multi-use facility that has become a popular site for campus and community gatherings, weddings, and special events. The restoration, which was completed in September 2015, was made possible by a $5 million grant from the Helen and Will Webster Foundation. Architect Richard Fernau (BA, philosophy, '69) led the project. A zone-controlled, in-slab, all-electric radiant heating system that circulates hot water through the exposed concrete floor. Highly insulated roofs, walls, and windows that lower heat loss. Large barn doors, windows, and skylights that provide cross ventilation and give occupants hands-on control of the indoor environment, while also minimizing repair and maintenance costs. A high-efficiency, occupant-controlled LED lighting system, modeled and specified by Assistant Energy Manager Sarah Gilchrist, that provides quality lighting with minimal energy. "The Hay Barn project is a perfect blend of innovation and restraint," said Patrick Testoni, campus energy manager. "We integrated simple but reliable systems into this historic structure, but we were restrained, too—avoiding big, complicated systems in favor of taking advantage of our mild climate." Leveraging local wind and weather patterns meant designers could rely on simpler heating and ventilation systems, which also blend in with the site ecology; the Hay Barn is located in the Cowell Lime Works Historic District. The Hay Barn's energy systems have earned rave reviews from users, as well. "Whether we have a small group of staff working in the office or a very large wedding party, there's great air flow, and it's relatively easy to get the place warm or cool, as circumstances dictate," said CASFS Executive Director Daniel Press. "The energy systems operate very much in the background, out of sight and quietly, so we can focus on our work and the beautiful aesthetics of the barn itself." The goals of the renovation were to maintain the historic nature of the building, dramatically increase its comfort, and reduce energy use to the point that its consumption could be offset by a new central campus photovoltaic array. 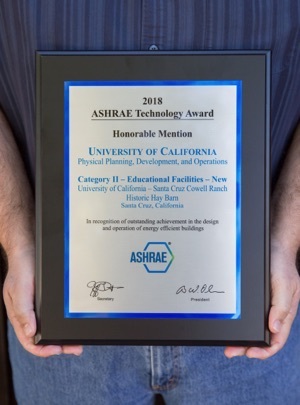 After two years of operation, the barn uses only about one-fifth the average energy typically used by 50 university buildings in the state, according to the campus's ASHRAE award submission. An added benefit of the simple mechanical systems that were used is that the cost was only $25 per square foot—about half of the normal industry standard in the region, according to the campus award submission.